We’re used to smart meters measuring electricity and water. But now British start-up Winnow has developed smart meters that analyse our trash. They are used in commercial kitchens to measure what food gets thrown away, and then identify ways to reduce waste. Up to a fifth of food purchased can be wasted in some kitchens, and Winnow has managed to cut that in half in hundreds of kitchens across 40 countries, saving its customers over $25 million each year in the process. That is the equivalent of preventing one meal from going to waste every seven seconds. This innovation earned Winnow the Circular Economy Tech Disruptor Award. The textiles industry uses vast quantities of water and chemicals and produces huge amounts of toxic waste, which is a major problem in countries like China, India, Bangladesh, Vietnam and Thailand. But Dutch company DyeCoo has developed a process of dyeing cloth that uses no water at all, and no chemicals other than the dyes themselves. It uses highly pressurised “supercritical” carbon dioxide, halfway between a liquid and a gas, that dissolves the dye and carries it deep into the fabric. The carbon dioxide then evaporates, and is in turn recycled and used again. 98% of the dye is absorbed by the cloth, giving vibrant colours. And because the cloth doesn’t need to dry, the process takes half the time, uses less energy, and even costs less. The company already has partnerships with major brands like Nike and IKEA. This Australian company has spent more than a decade recovering value from old printer cartridges and soft plastics. Their new innovation turns these materials into roads. The products are mixed in with asphalt and recycled glass to produce a higher-quality road surface that lasts up to 65% longer than traditional asphalt. In every kilometre of road laid, the equivalent of 530,000 plastic bags, 168,000 glass bottles and the waste toner from 12,500 printer cartridges is used in the mix. So instead of ending up in landfill, all that waste is given a new life, getting us where we need to go. Using trash to run your car may sound like something from Back to the Future, but Canadian firm Enerkem has turned it into reality. Their technology extracts the carbon from trash that can’t be recycled. It then takes five minutes to turn the carbon into a gas that can be used to make biofuels like methanol and ethanol, as well as chemicals which can be used in thousands of everyday products. The city of Edmonton, for example, now reuses 90% of its waste, saving more than 100,000 metric tons of landfill every year. French-based Schneider Electric, which specialises in energy management and automation, won the Award for the Circular Economy Multinational. Employing 142,000 people in more than 100 countries, it uses recycled content and recyclable materials in its products, prolongs product lifespan through leasing and pay-per-use, and has introduced take-back schemes into its supply chain. 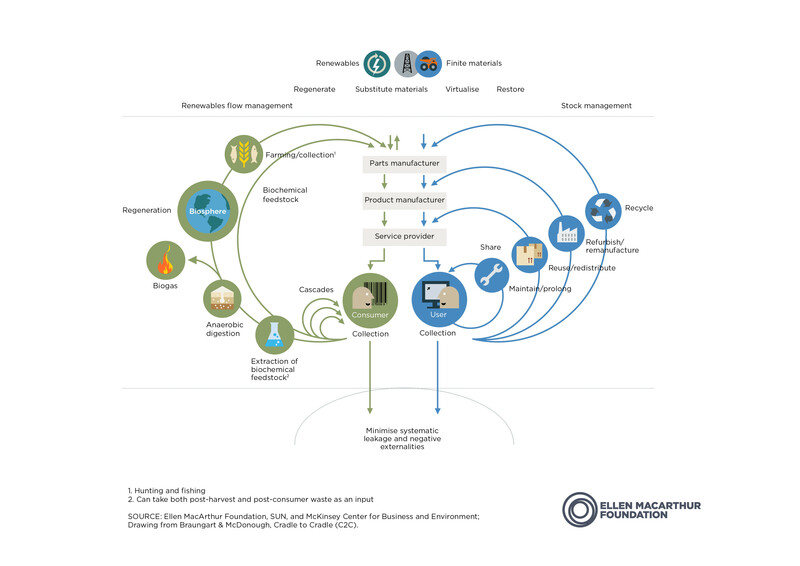 Circular activities now account for 12% of its revenues, and will save 100,000 metric tons of primary resources from 2018-2020. This US firm’s EcoVolt technology treats wastewater contaminated by industrial processes, not just turning it into clean water, but even producing biogas that can be used to generate clean energy. Cambrian Innovation has nine plants across the US, which have treated an estimated 300 million litres of wastewater. This Atlanta firm turns old tyres and other rubber waste into something called micronized rubber powder, which can then be used in a wide variety of applications from tyres to plastics, asphalt and construction material. Five hundred million new tyres have been made using its products, earning it the Award for Circular Economy SME. Smartphones and tablets have changed the way many of us live and work, but our appetite for the latest must-have gadget has created a mountain of discarded devices. HYLA Mobile works with many of the world’s leading manufacturers and service providers to repurpose and reuse either the devices themselves, or their components. It’s estimated that more than 50 million devices have been reused, making $4 billion for their owners and stopping 6,500 tons of e-waste ending up in landfill. People’s Choice Award winner TriCiclos began in Chile in 2009 with the stated aim of working towards a “world without waste”. Since then it has built and operated the largest network of recycling stations in South America, diverting 33,000 metric tons of recyclable material from landfill and saving over 140,000 metric tons of carbon emissions. For the founder of Miniwiz, Arthur Huang, there is no such thing as trash. He is an evangelist for upcycling - turning old materials into something new. As he admits, this isn’t a new idea - until the 20th century reusing whatever was lying around was the norm. But he is taking this principle to new levels, with the scientists and engineers in his Miniwiz Trash Lab inventing over 1,000 new sustainable materials and applications. The Trashpresso machine is the ultimate expression of sustainable upcycling. It is a mobile upcycling plant that can be transported in two shipping containers to its customers. Once there, it turns 50kg of plastic bottles an hour into a low-cost building material, using no water, and only solar power. Proving that innovation in the circular economy isn’t confined to small tech start-ups, the world’s largest brewer wants 100% of its product to be in packaging that’s returnable or made from majority-recycled content by 2025. Already nearly half of its drinks are sold in returnable glass bottles, and AB InBev is working with suppliers and customers to increase that. It has also launched a protein drink made from spent grains from the brewing process (which previously were only resold as animal feed).